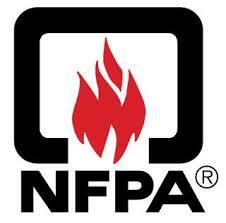 The Fire Protection Research Foundation (FPRF) is the research wing of the National Fire Protection Association. Its role is to “plan, manage and communicate research in support of the NFPA mission.” The FPRF has a few new studies underway that we think bear paying attention to going forward. The first, “Sprinkler Protection for Cloud Ceilings – Phase 2”, concerns the potential interference that recently introduced “cloud ceilings” pose for the efficiency of sprinkler systems in buildings. Cloud ceilings should not be confused with (much more ubiquitous) drop ceilings; rather they are decorative panels suspended from ceilings to achieve a functional or architectural effect in a commercial or industrial interior and can range from small overhead units to close-to-full-room-area arrangements with small gaps at the perimeter wall location. (Here’s an example, and here’s another.) These workplace décor elements have been gaining in popularity so quickly that they have caught fire-prevention authorities temporarily off guard. In Phase 1 of the study, the FPRF reported that NFPA 13, Standard for the Installation of Sprinkler Systems, does not provide definitive guidance on automatic sprinkler installation requirements for these types of ceiling improvements. Indeed, recent proposals to amend NFPA 13 have failed because predictive models of the effects of cloud ceilings in fire situations are as yet not fully clear. The second project, “Evaluation of Water Additives for Fire Control and Vapor Mitigation – Phase 2”, is a follow-up trying to “provide a repeatable and reproducible evaluation methodology of the performance characteristics of water additives used in fixed fire suppression systems for fire control and vapor mitigation.” There are now several substances that manufacturers claim can be added to the water supply firefighters use in Class B applications involving 2- and 3-dimensional liquid fuel fires, such as those found in power plants and similar facilities. Some of these boast of superior fire suppression capabilities through emulsification or encapsulation. Unfortunately, these additives have not been properly tested by competent, independent agencies. The results of these studies will be published by the FPRF on the NFPA website soon. We look forward to learning more from them about these important topics.